The book collects contributions from A. Bassi, F. Powell, M. Geoghegan and L. Boccacin. They illustrate two national cases-studies, concerning Italy and Ireland in a comparative perspective, in order to evaluate the most recent social, cultural and institutional development of social partnerships between state, market, and third sector. 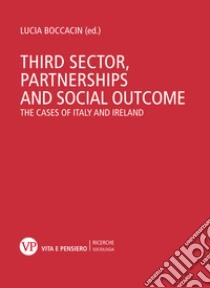 From a sociological point of view, the term ‘partnership’ refers to a structural configuration characterized by the co-presence of different social subjects – state, market and third sector – and by reciprocal and collaborative social action that seeks to achieve project goals and is based on the implementation of mostly medium to long-term relations.The Italian and the Irish cases are analyzed, in order to understand experiences of social partnerships, different ways of their realization, risks or critical points and opportunities.